Farming stakeholders are being given the opportunity to have their say in shaping the future of agriculture in Northern Ireland. In a review that represents the biggest change to the industry over the last 40 years, the Department of Agriculture, Environment and Rural Affairs (DAERA) is to engage with the wider farming, food and environment sectors on proposals for the future agricultural policy framework for Northern Ireland. Brexit is the driving force here with the current Common Agricultural Policy (CAP) no longer applicable to Northern Ireland once the United Kingdom leaves the European Union. As it stands, 2019 is the final year of CAP with a transition period to a domestic agenda taking place through 2020. It is against this landscape that stakeholders are being urged to come forward and make their views known on a ‘Future Agricultural Policy Framework’ document, which was launched on Wednesday, and is designed to help shape debate on future support arrangements. 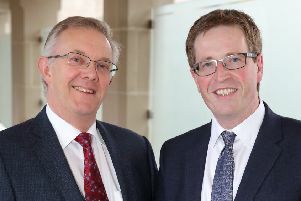 Norman Fulton, Deputy Secretary Food and Farming Group at DAERA, said: “Following our initial and very informative engagement with a number of stakeholders representing farming, food and environmental interests, we are now seeking views from across a much broader range of stakeholders on possible support arrangements in Northern Ireland as we prepare to leave the EU. “CAP payments have been important in sustaining the industry, underpinning its competitive trading position and developing its environmental performance, so it is essential that the industry in Northern Ireland is provided with some certainty in relation to future support arrangements in the shorter term. There is also a need to develop a longer term agricultural policy framework and deliver a managed transition over a number of years. Among the suggestions contained within the document are how payments and entitlements would be handled going forward, including changes to the Basic Payment Scheme. The options include continuing the current transition towards a flat rate payment by 2021 or freeze the value of entitlements at the end of 2019, which see the value of entitlements remain the same for 2020 and 2021. There is also scope to change the Greening requirements which are currently relevant to only a small sub-set of local farmers. Greater emphasis is being put on education throughout the industry with a desire to see Level 3 qualifications obtained by business owners and further professional development options being made available. A ‘Productivity Grand Challenge’ approach towards science and innovation is suggested which might include a multi-actor approach of science, innovation, knowledge transfer, education, policy and industry. In terms of a improved resilience for the industry, the payment of a basic farm resilience support measure is an option. However, there is concern that such payments might reduce the drive to innovate and reduce the incentives to manage business risks. It is recognised that an organised transition is required from the current CAP regime, which is dominated by income support, to a new domestic arrangement. Environment remains an important issue, however, and the document seeks to develop regulations which while simpler than those currently in place would encourage ‘positive behavioural change’ and would secure the long-term environmental sustainability of the sector. The Ulster Farmers’ Union has welcomed the publication of post-Brexit options for the farming industry in Northern Ireland. However, UFU president Ivor Ferguson says that with time short, it is frustrating that it has taken so long to get the document onto the table, with Northern Ireland the last UK region to put possible framework measures out to industry consultation. The UFU says it accepts publication has been more difficult here because of the lack of an Executive. It says it is pleased the document contains many of the ideas put forward by the UFU last year as key principles for a new agriculture policy. These became part of a DAERA/stakeholder document finalised in January and has now been incorporated into this latest document. He also said that the UFU would work with other stakeholders to ensure farming, the environment and food processing could have a post-Brexit joined up future. AgriSearch has also welcomed the publication of DAERA’s stakeholder engagement paper on the future agricultural policy framework for Northern Ireland. AgriSearch Chairman John Henning said: “We are pleased that the document recognises the importance of science, innovation, knowledge exchange and continuous professional development in delivering both increased productivity and improved environmental sustainability. AgriSearch is already leading and participating in a wide portfolio of research projects that are aimed at delivering these goals. “We welcome the proposals to take a broader look at the “Productivity Grand Challenge”, the adoption of a multi-actor approach and a move to longer term research programmes. We would particularly welcome the integration of science with knowledge exchange and education.